Today’s Convivio Book of Days chapter begins with an apology, for giving you some inaccurate information in the previous chapter (The Printer’s Devil’s Wayzgoose)… which is a bit ironic, considering that I touched on the topic of “fake news” and rumor and misinformation. In that chapter, I told you that St. Bartholomew, whose feast day on the 24th of August is the source of the traditional printers’ Wayzgoose celebration, is a patron saint of printers, papermakers, and bookbinders. That’s not quite right, and I apologize for misleading you. He is a patron saint of bookbinders, but not of the other two branches of the Book Arts trades. He is, however, so wrapped up in all things related to the Book Arts, that I will beg your understanding for my error. Today, however, we do have a feast day of a patron saint of printers. It is the Feast of St. Augustine of Hippo, patron saint not just of printers, but also of brewers. As a letterpress printer who has dabbled in brewing, this is a holiday I can really get behind. My plan for the day, since I have wrangled a day off from work, is to fire up the Vandercook No. 4 and print at least one run of the type forme I composed and set in the bed of the press last January. And, obviously, Seth and I will have to pop the cork on some special brew or other. 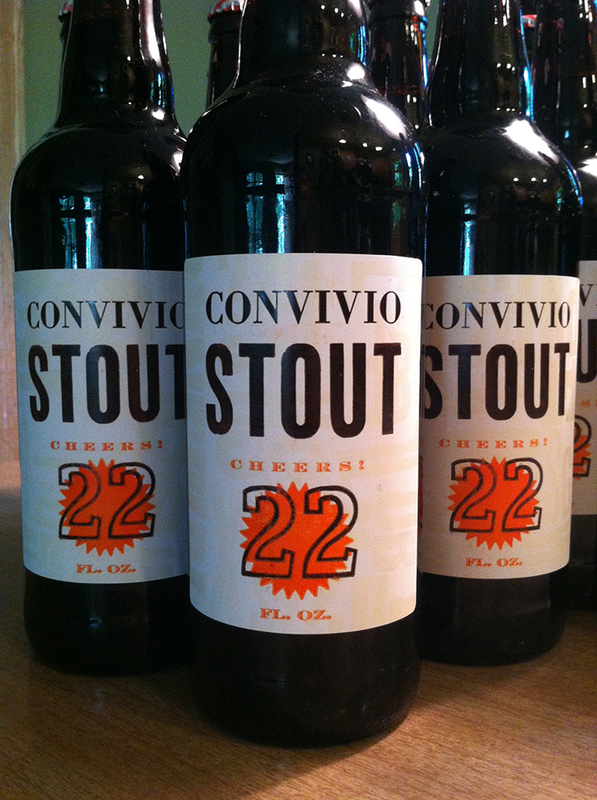 We have just one bottle left of our Convivio Stout, and maybe this is the night to empty it. As for St. Augustine himself, he was born in Northern Africa, in what is now Tunisia, in 354, the son of St. Monica. He became a patron saint of printers thanks to his prolific writing. Books like his Confessions probably kept a lot of early printers in business. The confessions were easy to come by for Augustine: he was a fellow who liked a good time, at least early on in life, and this is the root of his patronage for brewers. His mother prayed for his conversion. Eventually he did convert and he began to write. He was long considered a Doctor of the Church and was canonized at the turn of the 14th century, about 150 years before Johannes Gutenberg perfected the idea of moveable type and ushered in the information and literacy revolution that came with the proliferation of printing. It is said that on a wall of his room St. Augustine had written these words, in large letters: “Here we do not speak evil of anyone.” Words of wisdom, worthy of writing on our walls or printing on our presses or sending to our elected officials, and words to live by in this week of celebrations print and book related––this week of Wayzgooses and related celebrations of papermaking, printing, bookbinding, brewing. All crafts of the human hand and heart, all, in their way and in proper doses, portals bridging earth and heaven, assisting us mere mortals to attain that graceful state of happiness in flow. I’ll take that. Image: Our own Convivio Stout. Alas, but one bottle left. It’s the Convivio Stout Seth Thompson and I brewed some time ago, getting no better with age, I’m sure, but still, we’ve always hesitated to open the very last bottle. Perhaps this St. Augustine’s Night is the time to do it. The good news is I printed plenty of labels. They are letterpress printed by hand in three print runs: a subtle background of wood type printed in transparent white on white, plus the orange and black runs. Back to the brewing, then! Thanks to all who came to the Library Wayzgoose Festival on Saturday. It was a blast! And don’t forget: today is primary election day here in Florida. Get to the polls! You have until 7 PM here in Palm Beach County. Summer is quickly waning. It’s still plenty hot here in Lake Worth (and it will be for weeks to come) but the kids are back in school for a couple of weeks now, and that is the surest sign that summer is near to ending. Another sure sign: the sun is setting much earlier now than it was just a month ago. The longest day that came at St. John’s Day in June is long past as we inch closer and closer to the balance of day and night that comes with the equinox of September. And today we have a reminder of this, steeped in tradition: It is St. Bartholomew’s Day––Bartlemas, a day celebrated less in churches so much as it is amongst practitioners of the Book Arts: papermaking, bookbinding, and most especially the one that is sometimes referred to as the Black Art: printing (more on that Black Art thing later). St. Bartholomew is a patron saint of all these noble professions (Post print addendum: actually, he is a patron saint only of bookbinders. See the next chapter, Here We Do Not Speak Evil of Anyone, for the clarification and my apology), and his feast day on the 24th of August brings the Bartlemas Wayzgoose, a particularly English celebration that comes out of this shifting of the seasons. We know very little about the historical St. Bartholomew. He was one of the Twelve Disciples; that much we do know. He may have traveled to India, to the area around Bombay. Tradition says that he met his end in Armenia in the first century. His martyrdom was a gruesome one––one that by association made St. Bartholomew a patron saint of butchers and of tanners and of bookbinders, who very often bind books in leather. I’ll leave the method of his martyrdom, based on those associations, to your imagination, but there, nonetheless, is our connexion to the bookbinders. For papermakers, the connexion goes back to the days before glazed glass windows. Back then, it was waxed paper that was used to keep out the elements, and the arrival of Bartlemas was the signal that it was time to paper the windows in preparation for winter. Once this St. Bart’s window paper was made, the papermakers went back to making paper for the printers, clearing out the vats and recharging them with new pulp made from rags that had been retting all summer long. To be sure, there was a good quantity of ale consumed as part of the Wayzgoose. In some places, mead, the delightful intoxicating beverage made from honey, was the beverage of choice. Especially in Cornwall, where a Blessing of the Mead ceremony takes place even today at this time of year. Continuing the road of connexions, our friend St. Bartholomew is also a patron saint of beekeepers, and as we continue to gather our stores for the coming winter, it is traditional, too, to bring in the honey crop on his feast day. It was on August 27, 2010, that the Jerusalem Post reported that Johannes Gutenberg’s 42-Line Bible, the first book printed from moveable type, was completed on St. Bartholomew’s Day in 1454. I try every now and then to find other sources to back up this claim, but I have to date had no luck. Still, I like the idea of this and if it is indeed true, this may have something to do with the day becoming a matter of such importance to printers and bookbinders and papermakers. Some say, too, that that first printed book explains why printing has a history of being called the Black Art. They claim that Johannes Fust, Gutenberg’s business partner, sold several of the printed bibles in France without explaining how they were made. When it was discovered that the books were identical copies of each other, Fust was accused of witchcraft and was briefly imprisoned for that crime. It was a different world back then, with information spread by rumors. It was the printing press, though, that ushered in an age of knowledge and literacy and enlightenment. Some would say, too, that we have reverted back to those medieval ways: there are those who claim time and time again that the printed word is not to be trusted, calling trusted information sources “fake news,” feeding us their own brand of information through social media, the 21st century equivalent of medieval rumor. 564 years after Gutenberg, we find ourselves suddenly no better than Johannes Fust’s accusers. One thing is certain: if you are a book artist or if you are a book enthusiast, this is a very auspicious day for you. 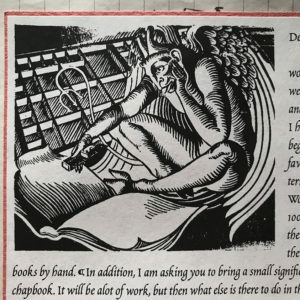 For this Bartlemas Wayzgoose, then, perhaps we have cause to celebrate the book and the people who make books: the papermakers, the printers, the bookbinders, the book artists. This Bartlemas, let us raise our glasses to St. Bart and to all of these good artisans… and to celebrate the printed word and make a pledge to value its importance to good living and to good citizenship. The printer’s devil and his Black Art might just be more important than we think. Image: On the approach to my very first book arts class, which was at the Penland School of Crafts in July, 1994, I received a postcard in the mail from the instructor, Steve Miller. 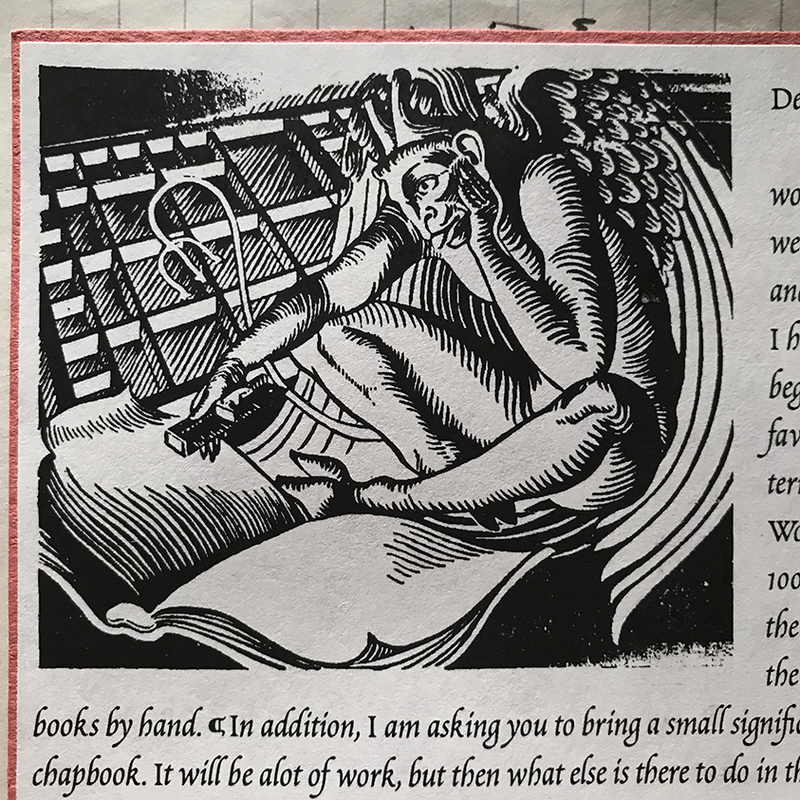 His class was my introduction to printing and the book arts, and I had a good feeling about it from the time I beheld that postcard with its illustration of a printer’s devil setting type in a composing stick. Now, these are the tools of my trade. Its ties wend back through time, back to the Mainz workshop of Fust & Gutenberg. Won’t you join me at our own local Wayzgoose? It’s the Library Wayzgoose Festival and it’s happening tomorrow, Saturday August 25, from 10:30 AM to 5:30 PM, at the Jaffe Center for Book Arts and throughout the east third floor wing of Florida Atlantic University’s Wimberly Library in Boca Raton. Admission is free. You’ll find activist printer Ben Blount there from Illinois, offering print demos all day in the print shop and a gallery talk at 3 in the Book Arts Gallery. You’ll get to make your own traditional paper printer’s cap. The League of Women Voters will be there, ready to register voters. There’ll be live music from Humble Waters early in the day and later, from Ella Herrera. There’ll be a bevy of local makers showing and selling their wares at the Wayzgoose Makers Marketplace. And lots more. Rain or shine, inside the library, we’ll be kicking up some fun and honoring that Wayzgoose spirit all day. Come to the Convivio Bookworks booth and say hello. We can wish each other a Happy Bartlemas, you in your paper printer’s cap, me in mine. The Fifteenth of August brings my maternal grandmother’s birthday, and since she was born on this day, the Feast of the Assumption, my great grandparents named her Assunta. American neighbors sometimes called her Susan or Suzy, but that just never sounded quite right to me in naming a small, feisty Italian woman who spoke broken English. Grandma always was Assunta, or, as Grandpa would call her, Assu. Grandma’s birthday and Ferragosto mean, for us, a simple supper of cucuzza longa simmered with eggs. It is hearty peasant fare that is quick and easy to prepare, which makes it the perfect sustenance for the evening of a hot day in late summer, especially when it is paired with a crusty loaf and some wine––perhaps a sparkling white or a rosé, or maybe, if you have someone like Grandpa in your life, a pitcher full of the finest summer peaches, sliced, with red wine poured over them and set in the refrigerator for just a few minutes before dinner is served. This, anyway, will be our Ferragosto dinner. I encourage you to join us. You’ll need to first get hold of cucuzza longa. This translates to “long squash” and in fact these past two years I’ve found them in markets labeled as just that. They are not a squash at all, but actually an edible gourd, which, left to their own devices, will grow to two or three feet in length and might end up straight as pins or in curls like snakes. In markets, though, where uniformity is prized, chances are you’ll find them looking just like the ones in the photo above. For the locals: I found ours at Doris Italian Market in western Boca Raton (there are a few locations in South Florida; perhaps one near you). Rorabeck’s in western Lake Worth had them last year, but not this year (at least not yesterday). 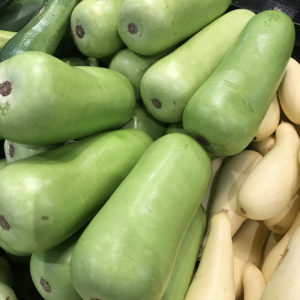 Whether you call them Long Squash or Cucuzza Longa, this is not a vegetable you’ll typically find in the supermarket; it’s definitely a specialty market thing. In a pinch, you can substitute zucchini… but the cucuzza is different and so much better. Here’s Mom’s recipe to prepare your traditional Ferragosto dinner. She learnt it from Grandma, who learnt it from Mom’s Great Grandma, and so on and so on… which is what I love about a meal like this: It’s not just dinner; it is, as well, a communion with others across time and space, and there is powerful magic in that. Wash and peel the cucuzza using a knife or a vegetable peeler, then cut into thick slices, each slice about 3″ long (you’re cutting lengthwise with the cucuzza, as opposed to slicing rounds). Chop the onion roughly and in a large pot, sauté the onion in olive oil until translucent and just beginning to brown. Add the crushed tomatoes to the cooked onion. Let simmer about 10 minutes. Meanwhile, in a large bowl, beat the eggs with a whisk, then add the parsley and grated cheese. (A note here about measurements: recipes like these, handed down from generation to generation, don’t come with precise measurements. You put a handful of this, a pinch of that. As Grandma would say (though she would say it in her Lucerine dialect): The more you put, the more you find.) 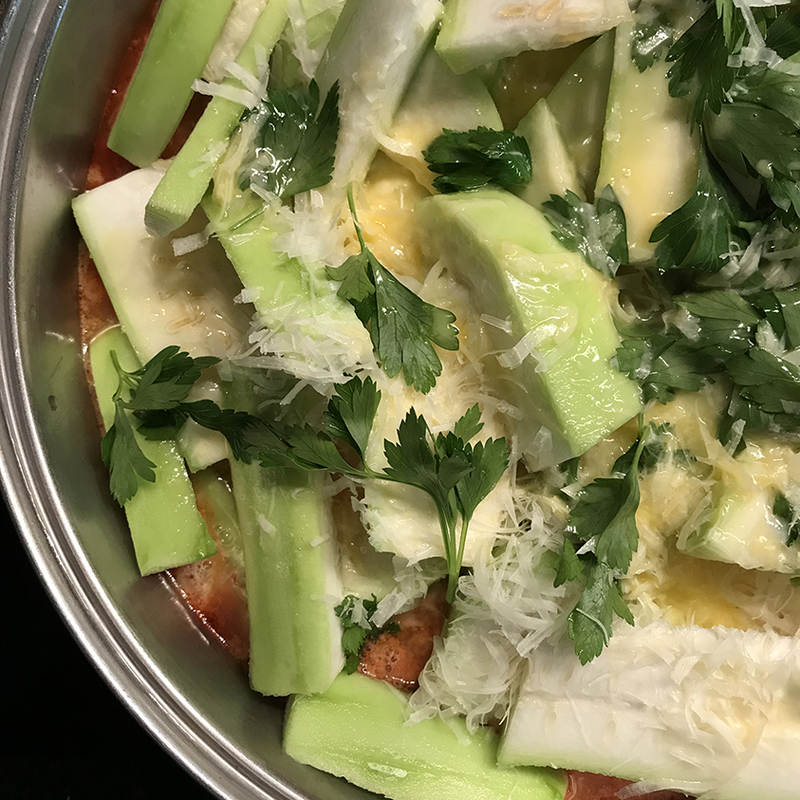 Once the tomato/onion mixture has simmered, add about one quarter of the sliced cucuzza, followed by about one quarter of the egg and cheese mixture. Continue layering cucuzza and the egg mixture until everything is in the pot. Add a handful of fresh basil leaves; season with salt and pepper. Simmer, covered, without disturbing, until the egg is set and the cucuzza is tender (about an hour, maybe less). All the ingredients, in the pot, about to be simmered. This one-pot summer meal will serve 6 to 8, especially if it’s served alongside warm, crusty bread, and perhaps a simple salad of escarole dressed with olive oil, wine vinegar, and salt. It’s delicious. And it was on our table pretty much each and every one of Grandma’s birthdays. Grandpa certainly loved it. He would have eaten his Ferragosto supper and then made a simple hand gesture, his finger pushed into his cheek with a forward twisting motion, proclaiming it Saporite!